Zoon Designs’ LED handrails are both a clever and surprisingly obvious way to light up a staircase. Named the Blind Handrail they are conceived to replace area lighting and put it where it is needed the most. The concept handrails even can be many colors, making the lowly stair well one of the most interesting spaces in a building. The LED handrails are still just a concept and there are currently no plans for production, but they seem like a very promising design. The handrails can illuminate in many colors, and potentially change color. And because they put the light where it is needed, they have the potential to reduce the need for expensive area lighting. The power is tucked into the wall supports with LED embedded tubes becoming the handrail. Like a Dan Flavin installation put to use, the cool factor is reason enough—the clean lines and dramatic effect are quite an artful sense of form and function. The clever handrails have the ability to transform any standard stairwell into a Tron-inspired space, perhaps even encouraging people to skip the elevator next time. This is interesting to think it will save energy and bulbs for that matter. The LED handrails are still just a concept and there are currently no plans for production, but they seem like a very promising design. The handrails can illuminate in many colors, and potentially change color. And because they put the light where it is needed, they have the potential to reduce the need for expensive area lighting. 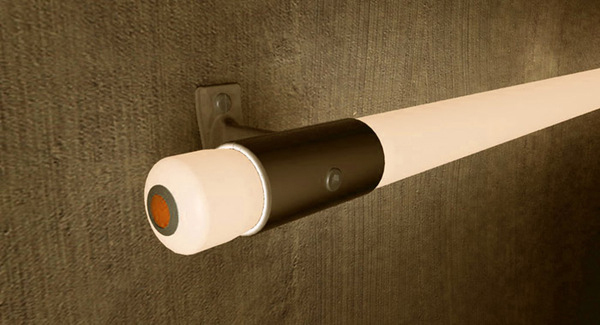 The power is tucked into the wall supports with LED embedded tubes becoming the handrail. 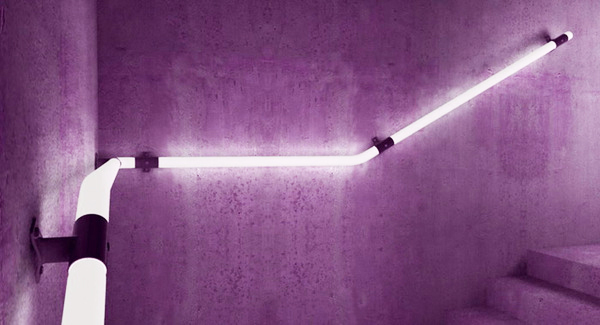 Like a Dan Flavin installation put to use, the cool factor is reason enough—the clean lines and dramatic effect are quite an artful sense of form and function. The clever handrails have the ability to transform any standard stairwell into a Tron-inspired space, perhaps even encouraging people to skip the elevator next time.